Hi everyone! 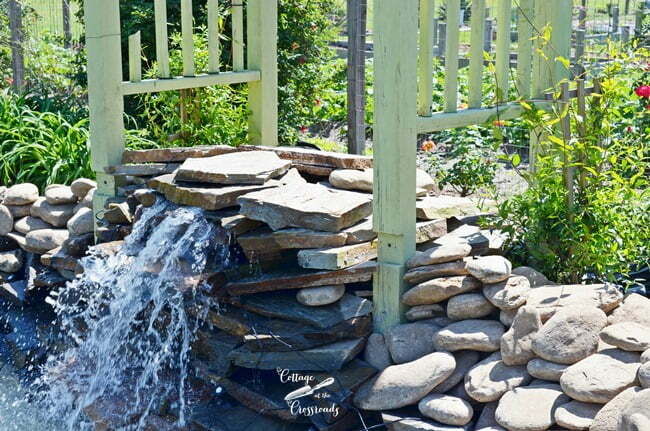 I’m back with Part 3 of our series of how we built our garden waterfall! If you remember in Part 2, Leo got the stones stacked and the water flowing to the waterfall. I just can’t explain how exciting that was and what a sense of accomplishment we felt. We got cleaned up and went out for lunch to celebrate. When we returned home a few hours later, the first thing we noticed when we drove up was that the water had stopped flowing! You see, the water level had dropped below the level of the skimmer where the pump is housed and immediately we knew that we had a major leak somewhere. 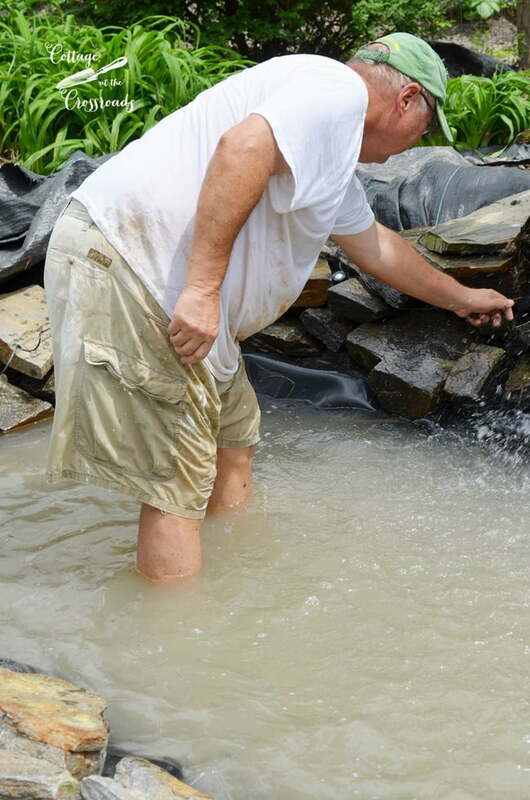 We filled the pond back up and determined that we were losing water on the sides of the waterfall. It just wasn’t all going back into the pond. So the next day, the stones were all removed. Using one the liners, we drew it up against the legs of the arbor so it would channel all the water back into the pond. 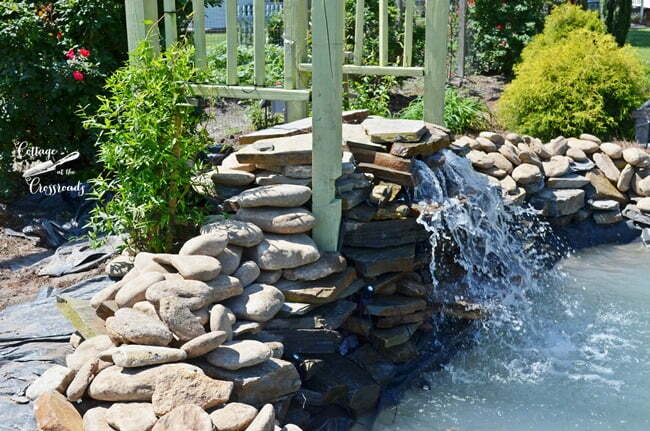 Leo and Jim carefully restacked the stones, creating a new waterfall. If you notice in the photo above, some of the stones are tilted forward so all of the water would fall back into the pond. This is not a job that we wanted to do, but we had to do it. And as far as we know, this was the only major mistake that we made. You can also see the round river rocks that we added on the sides, making that the third pallet of stones that we used for the whole project. 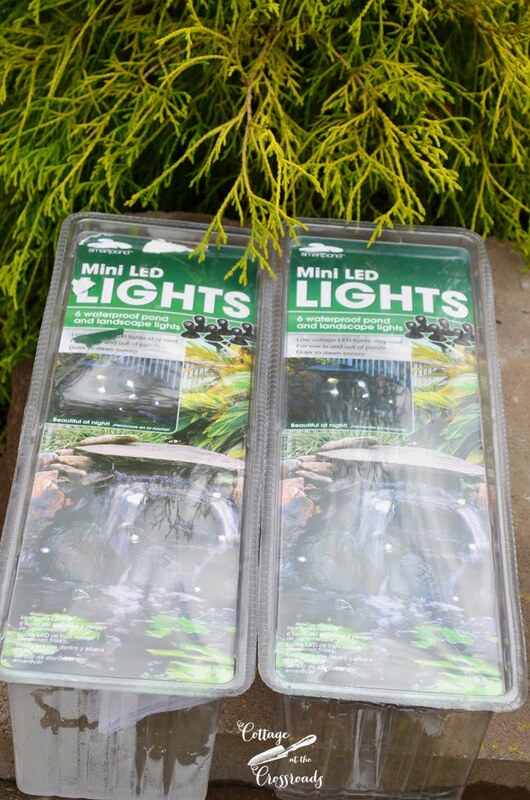 One of the really cool additions to the waterfall is these waterproof LED pond lights that Smartpond sent us. The lights were tucked up into the stones and they look awesome at night! I’ll be sure to include a photo of how they look at night in the BIG REVEAL! Here’s Leo placing the lights among the stones. There’s no way to do this job without getting wet yourself! Leo had also removed and saved the clumps of liriope in front of the waterfall, and we got it replanted. One of the things that I did all by myself was to cut away the excess pond liner. As you can see, I used a utility knife. I found that this job was so much easier with a fresh blade in the cutter! We added some small white decorative stones around the front edge. 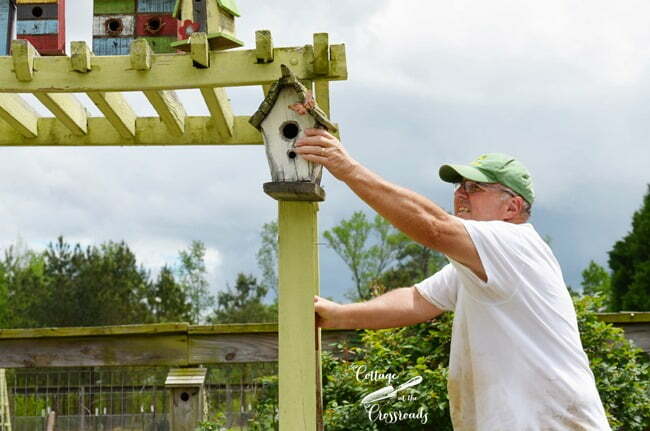 During all the construction, one of the bird houses had fallen from one side of the arbor so Leo climbed up on the rocks to remove the other one. And this is where it landed! The last time you saw this ladder, it was on our Christmas Porch. 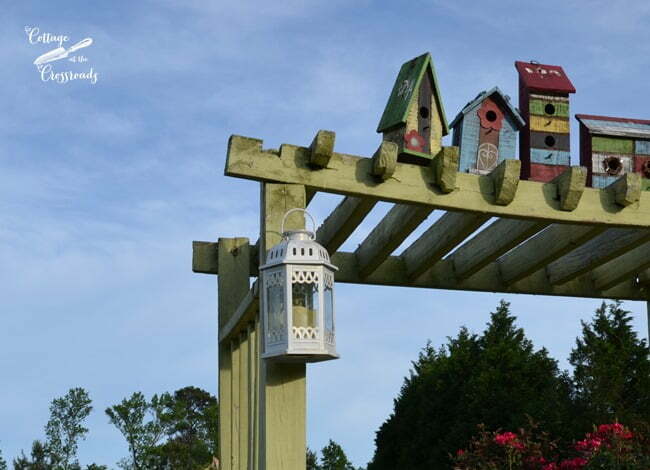 To replace the bird houses, we hung these solar lanterns on the arbor. You should see them at night! 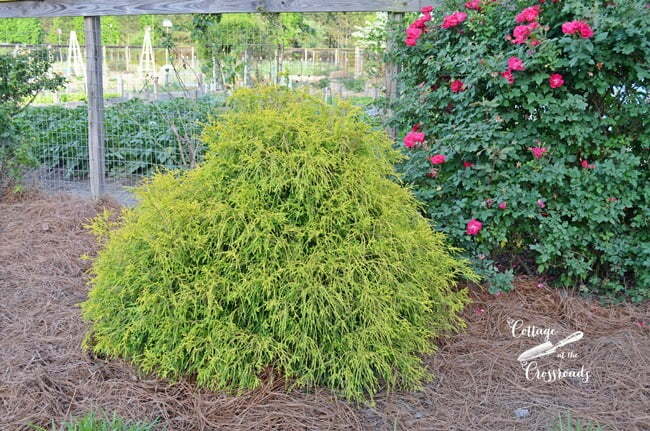 Part of our plan to spruce up the flower bed where the waterfall is located included planting another one of these mophead cypress plants. Five years ago, we planted four of these, but one of them died the first year and I wanted to get it replaced. I had to pay a pretty penny to get one large enough to go with the ones I already had, but it was so worth it. I LOVE these plants because they add good color in this area during the wintertime. 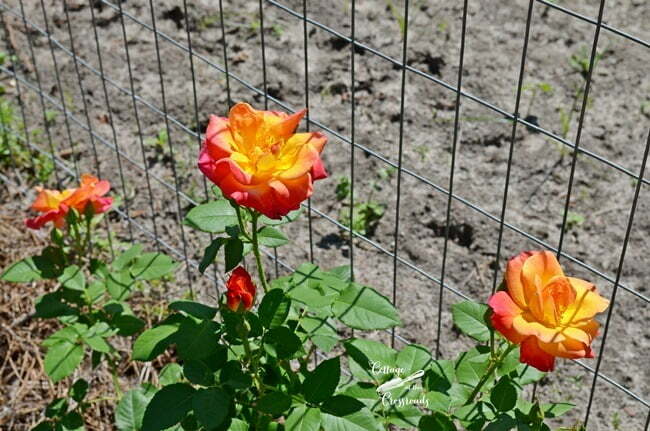 We also planted two more Joseph’s Coat climbing roses along the fence. I’m hoping I can keep the blackspot off these! 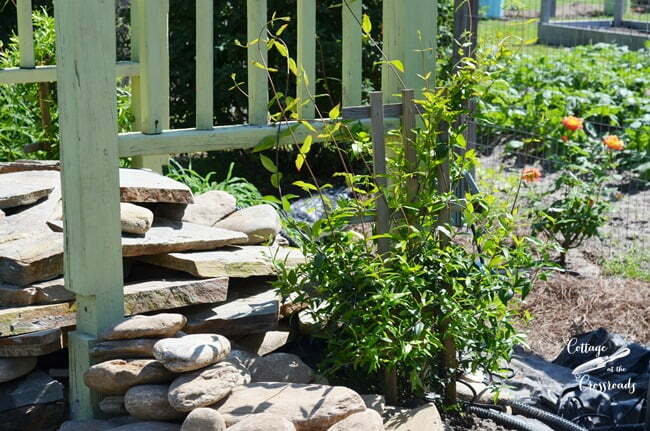 Two Carolina jessamine vines were planted on the back legs of the arbor. They are already growing rapidly and are beginning to twine around the pickets on the arbor. We’ve found that we love listening to the sound of the waterfall so much that we moved our Adirondack chairs from under the pecan tree to here. 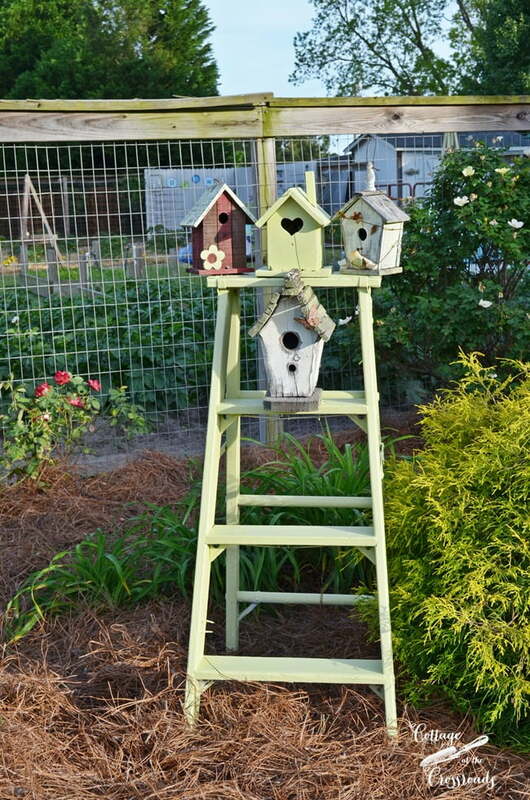 Leo thought we should give them a fresh coat of paint but I thought their chippiness blended better with the old arbor. 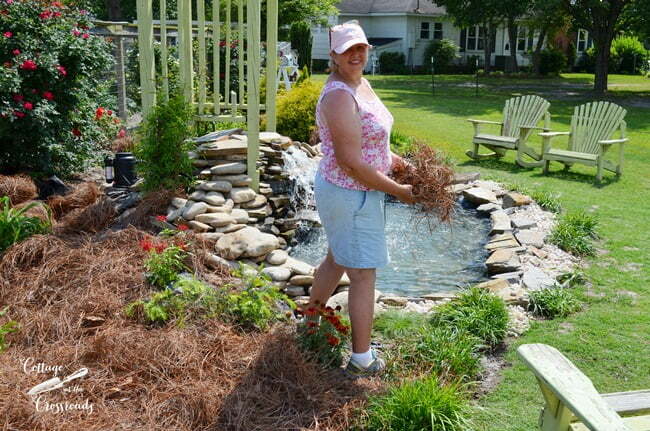 Some additional landscaping was done around the waterfall and I’ll give you a better look at that during the reveal, but here you can see me spreading pine straw in the area. 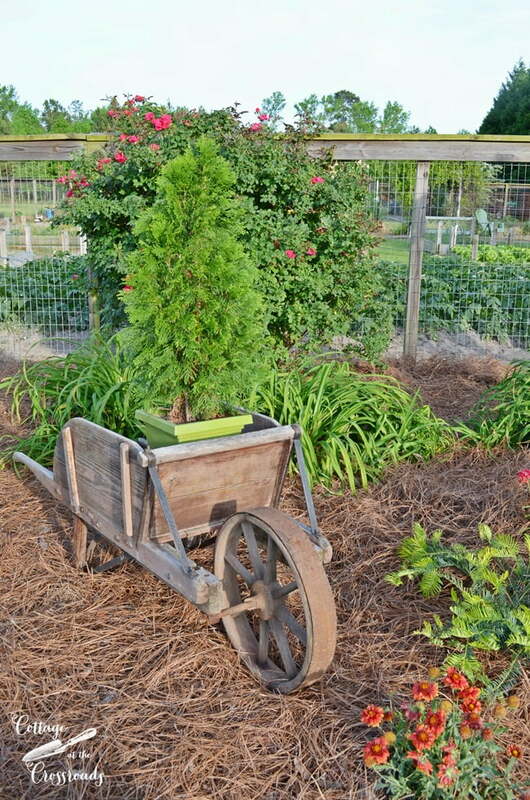 We decided to roll in our old wheelbarrow to see how it would look here. It was inside the house as part of our Gardener’s Christmas decor. 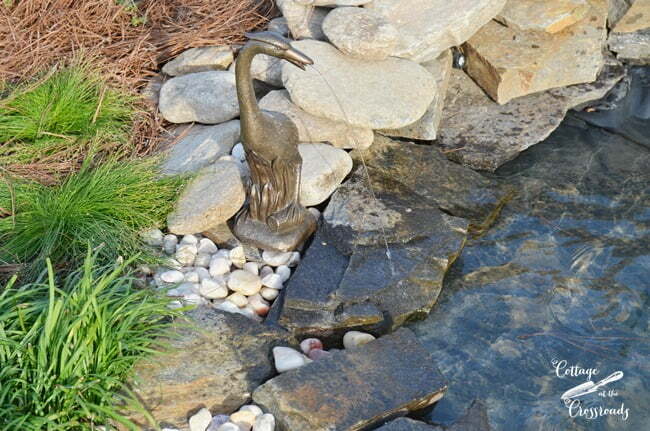 One of the last things we did was to add this pretty bronze heron spitter to the edge of the pond. In order to get water to it, we connected a smaller pump and ran the water through this UV pond filter which is designed to eliminate algae. 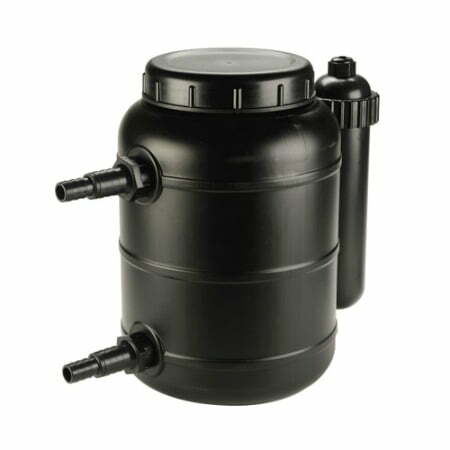 If you’d like to know more, our friends at Smartpond can answer all your questions about filters and pumps. Stay tuned because this week I plan to show you everything in the BIG REVEAL! I can barely wait to show it to you! I just reviewed your blog and was amazed!! You two have one spectacular waterscape!! 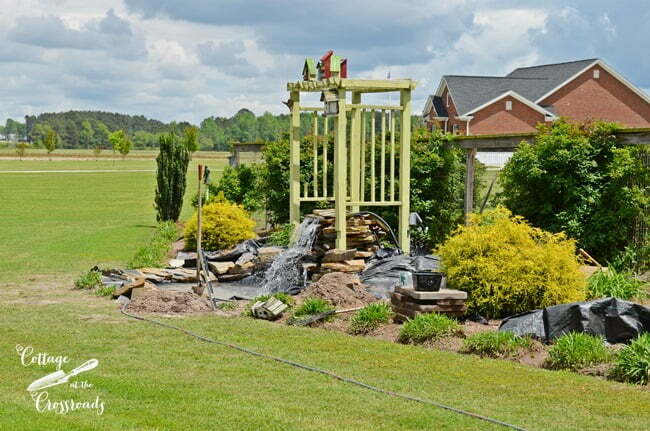 I so love the arbor and how you used it near the waterfall!! Your plants add so much appeal!! Great job!! How exciting it must be to sit in those chairs with a big glass of tea and listen to your creation!! Ahh…waterfall so relaxing!! I’m taking another look at our rock garden near our pool of many years!! It’s on a slope and Hubby always let’s me oversee such “special” outdoor projects!! I am so excited!! Thanks much for sharing your spectacular outdoor appeal!! Your hard work will surely bring you lots of pleasure for years to come!! You both truly deserve!! Regards!! This was a HUGE project with amazing results! As far as I am concerned it is just perfect. Someone just told me that a diluted mixture of dry milk and water will help the spot problems on the roses but I have yet to try it. I do know for those who would like another solution to snakes….they hate mothballs so I sprinkle them around the edge of the yard where they seem to like to visit from the vernal pond we have. No more of those big nasty water type snakes! Again beautiful waterfall and I still love listening to Leo’s music station. I can’t believe all the work you have done, it looks beautiful and I bet you were ready for bed every night. Wow…I cannot imagine how great the Big Reveal would be as what you are showing us is amazing!….Our backyard is screaming for a water feature….being former Floridians, we always had a pool and our last two homes in Florida had waterfall features in the pool and loved the sound of the water….nothing like the sound of a waterfall to put you in a happy place let alone the sheer beauty of it!….Great job you two!! I LOVE THIS!! So beautiful!! Great job!! I jut read up on the three posts about the pond. You guys did a wonderful job and I totally respect how much work went into it! 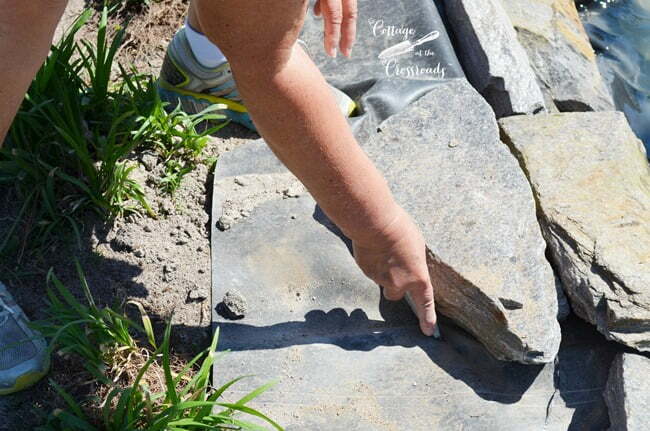 Having put in our flagstone patio and a fountain in 1999 I know what’s involved. I can tell the installation was done very well and you’ll have many years of enjoyment from it! We had fish in our pond but they add a lot of waste to the filtering system. Things like the herons can show up and we also had garter snakes hang around too. They’d eat the frogs that seemed to come from nowhere and join our pond each year. Ours was in a shaded location and we had a lot of other problems like algae big time so we ended up taking ours apart. We didn’t do as professional of an installation as yours so it was somewhat doomed from the start! Kudos to you both on this big undertaking- and it looks great! I know sometimes when you add a natural water gardening setting to your home, you also may invite some unwelcome company. Frogs can be pleasant guests; but sometimes can be invasive. They spawn once a year and may choose to populate your pond with tadpoles. There really is no easy solution to keep them away. One method that seems to work is to use 1 cup of table salt and 1 gallon of water mixed in a sprayer. 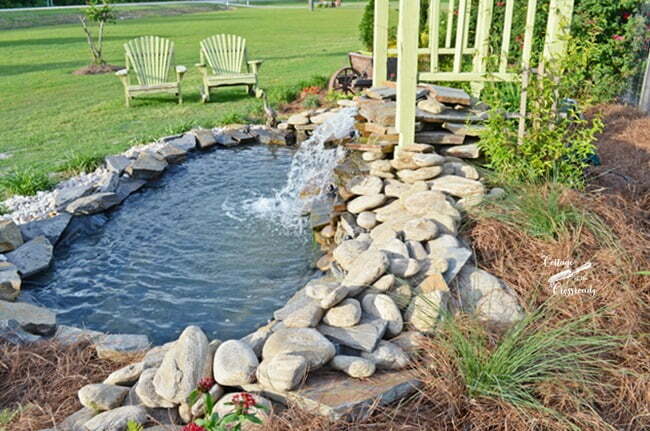 Spray the entire outside perimeter of your pond avoiding direct spray on plants and shrubs. It is believed that the salt will sting their feet without harm, stopping their advancement. Snakes can be good to keep the frogs away, but some people do not like the thought of snakes being so close to their water features. 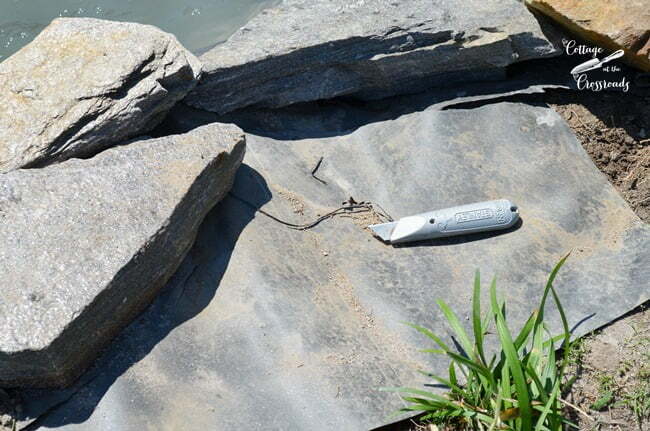 There is an effective product on the market to keep snakes at a comfortable distance. It is called “DR. T’s Snake-Away” which is made from natural nontoxic ingredients. Algae is always present since it is a part of the eco system. So it will feed off of other nutrients in the pond to grow. 1. Installing a properly sized U.V. Clarifier in the pond while the water is clear, will prevent the water from turning green. 2. For string algae, using a liquid algaecide will quickly reduce growth. Caution: please follow the label directions exactly, and be aware of how many gallons you are treating. If fish are present, using too much of the algaecide can have detrimental results. The liquid algaecide works by removing small amounts of oxygen which stops the algae. If too much is used, you are depleting the fish of their oxygen to live. 3. 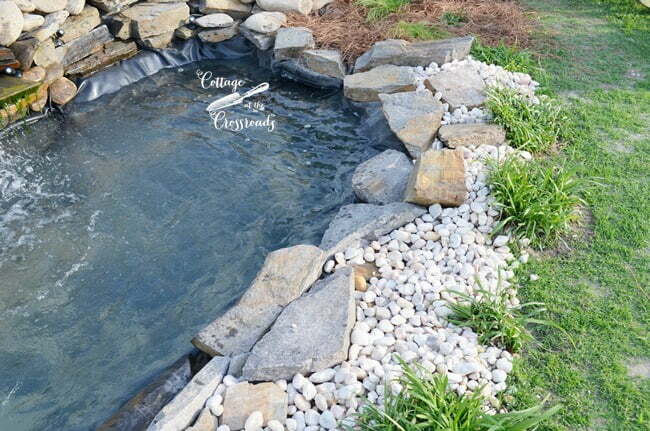 Adding plants that compete with algae for nutrients, and keep the water clean and clear may be added. These plants include hornwort, anacharis, cabomba. I love this, are you going to put fish in the pond? Cathy, we don’t plan to put fish in the pond because we have an outdoor kitty that would eat all of them! And some large blue herons live in a nearby pond and they would feed on them, I’m sure! 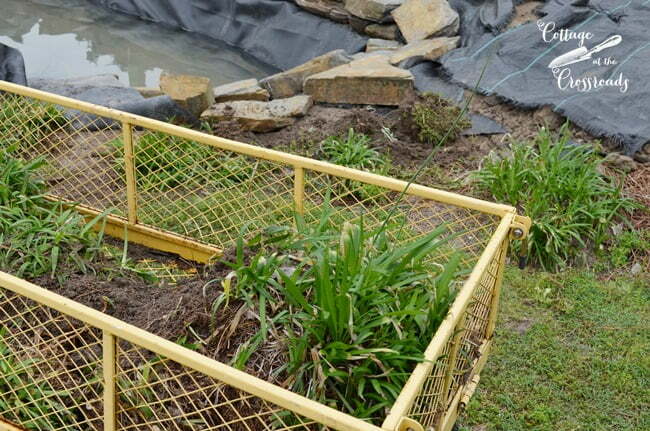 We do plan to put some aquatic plants in the pond, though! Oh Jane & Leo, it is looking wonderful. Can’t wait for the reveal with the little twinkle lights and all. You must be so excited!! What a beautiful addition to your landscaping!! It looks great! Can’t wait to see the reveal! This is absolutely beautiful! Where did you find the small white rock at the front edge? Kay, we bought those at The Home Depot. I think we bought about 5 bags. Can’t wait for the big reveal! Everything is perfect!!!! 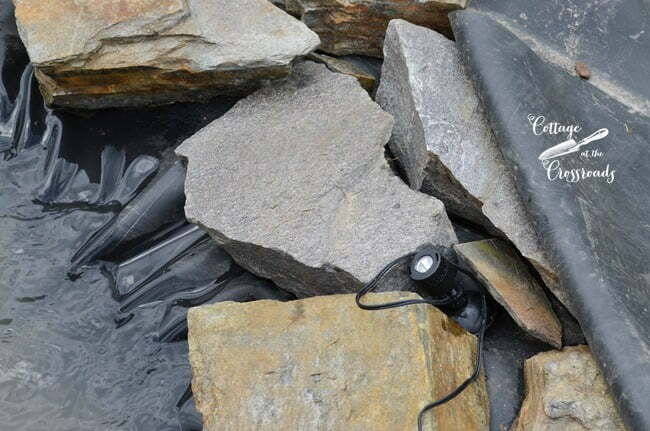 You both rock with this pond. How beautiful. 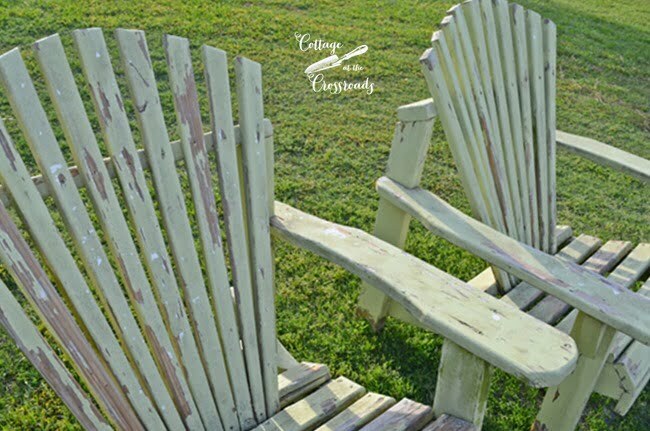 Love the chairs for a sweet relaxing spot. I love the sound of water too. I cannot wait to see the whole reveal. It is looking so beautiful and just full of charm. So much work, but now you have a lovely addition to your home that will be enjoyed for years to come. This looks SO gorgeous! 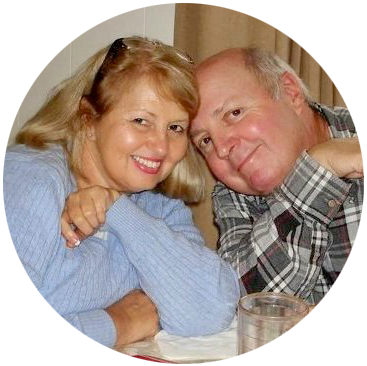 We have a condo now at Myrtle Beach, and every time we drive down I-20 and pass the Lamar exit, I think of you two and wondering what’s happening down the road. One day I’m going to take the time and stop by and take a tour! I’ll let you know before I do that, though! What an amazing project! Can’t wait to see theBIG REVEAL! I am like a little kid, I can hardly wait to see the reveal. I have been waiting each day to see how it is going. I just love water features and yours is so peaceful looking and beautiful. I love it. I am waiting for the reveal. Wow!! EVERYTHING LOOKS MAGNIFICENT! Can’t wait to see the big reveal, especially the pictures at night with the lights. Well done! 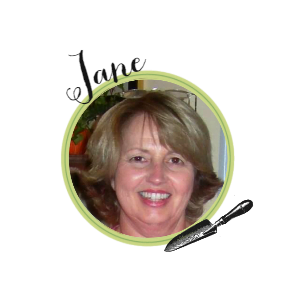 Wow Jane, I can’t believe all the work you guys put into this beautiful project! Your chairs look great there, what a spot to relax! !